Download our new ECS Company Brochure! 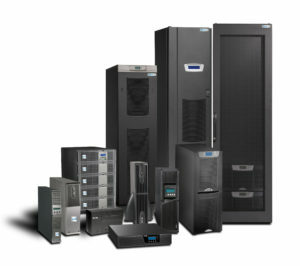 The Eaton UPS is your total solution for protecting valuable data and equipment from power problems. Eaton offers a full line of uninterruptible power systems (UPS), power management software and world class service. These products are used in networking, PC, financial, industrial, voice and data communications, military and aerospace applications, just to name a few. If you have requirements for continuous power that is essential to daily operations, we are your choice. Downtime is virtually intolerable in the manufacturing sector of our economy. Yet, Business Week magazine reports that “$26 Billion dollars a year of lost time and revenue can be attributed to power related problems.” Computerworld magazine reported that a price tag of $78,191 per hour cost on computer downtime for the average company. Also, according to Contingency Planning Research Inc., power problems are at the root of nearly 50% of data loss at computer installations in the US. Thus it makes economic sense to consider solutions that ensure a continuous, quality power supply that a UPS can provide. A study composed by Interpose Inc. analyzes the Total Cost of Operation for Windows based systems. They have dissected the cost of operations into Hardware and Software, Management, Support, Downtime and several other items. Their research indicates the TCO for the desktop PC runs in the neighborhood of $7250 per year! An incredible number! The figure we are most concerned with is the 20% allocation of the TCO to downtime! If we extrapolate 50% of that cost as being power related then approximately $725 of the annual cost of operation on a networked PC can be attributed to poor power!!! Take a look at this article on the costs and causes of downtime! costs and causes of downtime!